There have been moments when I did not think I would ever be able to complete the New Testament: Gospels and Epistles series, but it is now finished. Episode Forty-five completes the study with the final four of five Unique Events in the Gospel of St. John: Restoration of the Adulterous Woman; Foot Washing; Scriptural Warrant for the Sacrament of Confession/Penance; and Jesus’ post-Resurrection Breakfast by the sea with the eleven Disciples. Illustrations for the episode include work by Gustav Dore’ (from Dore’s English Bible); James Tissot; a 6th C. mosaic at Ravenna, Italy and another at the Hagia Sophia, Constantinople/Istanbul; a 16th C. Russian Orthodox icon in the Pskov tradition; and the ICHTHYS logo that was inspired, in part, by St. John’s account of the post-Resurrection breakfast. 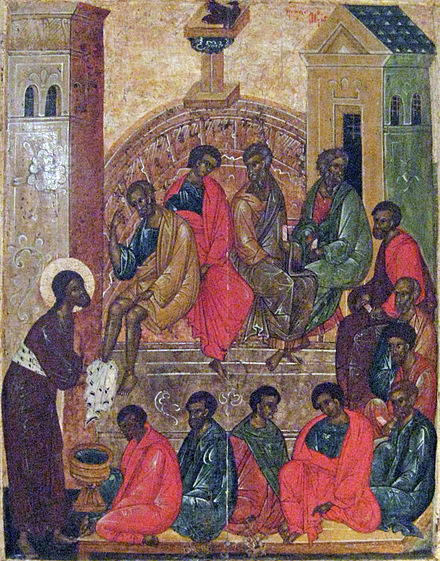 16th Century Russian Orthodox icon of Jesus Washing the Disciples’ Feet in the Pskov tradition. St. Peter points to his own head. Greetings. Corkie and I took several days off last week, making a mid-week visit to the Outer Banks of North Carolina, where it was hot one day, warm one day (with wind off the land side bringing flies), and downright cold one day (with a roaring wind off the ocean). We enjoyed visits to some of our favorite dining spots: Sam & Omie’s (great for breakfast), Ortega’Z (the Cubano sandwich for lunch), the Rundown Cafe (a Caribbean term that does not describe the state of the place) for a late afternoon lunch/dinner), and Tortuga’s Lie (another Caribbean term meaning a place and not a falsehood) for a late night dinner. The Volvo XC90 AWD did very well going up and down all those perfectly flat roads. We got back in time to help grandson Jaoob celebrate his 10th birthday. I have posted a Podcast Homily for Sunday After Ascension, focusing on the two readings, 1 Peter 4:7-11. which is more New Testament wisdom, and John 15:26 to 16:4, part of the final discourses with the Disciples on Maundy Thursday in which the compassionate Christ warns the Disciples the fate that awaits them because they followed Him. Listen to the Podcast Homily. If your local parish did not offer a service for Ascension Day (Thursday), you can find the complete Ascension Day service I read at my former parish, including the text and music for A Hymn of Glory Let Us Sing, the Venerable Bede’s written description of what the Apostles saw from Acts 1 at my Amazon author page in the AIC Bookstore publication, Occasional Services for Anglican Worship: Visit the Amazon page. 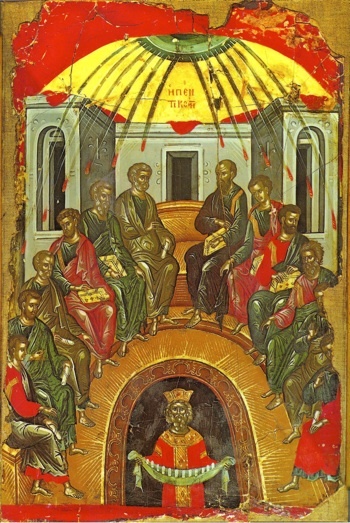 A 16th Century Orthodox Church icon of the Ascension from Bulgaria. 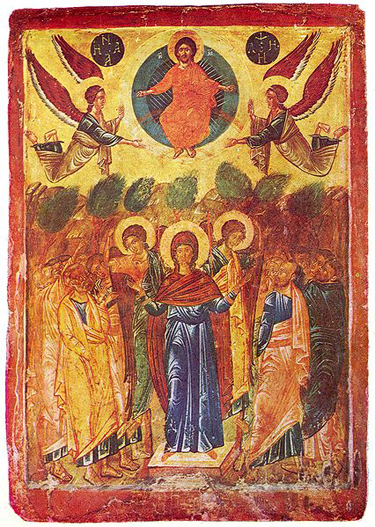 The 16th Century Bulgarian Eastern Orthodox icon for Ascension displays the amazed Apostles watching Jesus rise in a blue aura, with an angel on each side. The background is rich, bright gold with a darker gold border. Note the legends above the angels which contain traditional symbols of Christ. In the 8th Century, the Venerable Bede, the distinguished first historian of the Church in England which gives us our only view of the Church as it existed at that time, wrote A Hymn of Glory Let Us Sing which remains the model for Ascension Day music, especially in the Anglican and Lutheran traditions. Sung to the German tune, Lasst Uns Erfreuen. the hymn has seven verses with seven alleluias (a double halleluia at the end of the first stanza of each verses and a five-part Alleluia chorus following each verse. Have a glorious Sunday After Ascension celebrating Christ’s return to the Father from Whom He descended at His Nativity. The weather in the Richmond area has been wonderful, with cool nights and warm days, modest amounts of rainfall and not much wind. I’ve been busy removing snake strawberries and wild violets out of my back yard with a hand tool (since all the chemicals which will get rid of both will also kill the abundant growth of clover which keeps the yard looking green! The Visit of Nicodemus is illustrated using the stained glass window by Franz Mayer of Munich at St. Joseph’s Villa Chapel, Richmond, VA, from the AIC Bookstore publication, Paintings on Light: the Stained Glass Windows of St. Joseph’s Villa Chapel. The Mayer artist include such details as the dark blue sky with stars to suggest the evening visit described by St. John. Jesus stands over a seated Nicodemus, whose robes are embellished with elaborate borders. The raised right hand/arm suggests Jesus is granting a Blessing on the Pharisee who became a defender of Jesus and who brought aloe and scented herbs for His burial. Episode Forty-four is the next-to-last episode on the Gospel of St. John before I resume production of the revised series, Revelation: an Idealist Interpretation. The final four Unique Events are the Restoration of the Adulterous Woman; the Foot Washing of the Disciples; Jesus’ institution of the Sacrament of Confession/Penance; and His post-Resurrection meal with the remaining eleven. GRANT US, O Lord God, that as we assemble here today, our minds released from worldly thoughts and our attention turned to Thee; we may stand in Thy presence with tranquility, offering ceaseless praise and uninterrupted thanksgiving and acknowledging the loving-kindness through which our lives are directed, ruled and protected and our souls saved; to Thee we offer praise and thanksgiving; now and ever and unto the ages of ages. Amen. As always, thanks for your interest in the Internet-based ministry of the Anglican Internet Church. I am hopeful that I can finish discussion of St. John’s Gospel with Episode Forty-four. If so, I will begin work on the next installment in the You Tube version of Revelation: An Idealist Interpretation. I had produced it program as a live feed video on the UStream system a few years ago, but, owing to the extremely poor quality of the images I deleted the whole set when I stopped using UStream at the time the parish of St. Chrysostom closed down. The new versions are based upon the old text, but include the much-broader catalogue of images which can be inserted into the iMovie format I now use. I hope to get started during the month of May. In order to stay within a 20-25 minute per episode format, there will have to be many more episodes with the iMovie format. I also uploaded to the Podcast Homilies page at the AIC Web Site, the homily for Fourth Sunday After Easter, which includes a reading from the Epistle of James and more from the Gospel of St. John, Chapter 16. For reasons which are not clear, the Gospel reading from John is the verses which come before the verses used for the Third Sunday After Easter. I think treating them in order would have been better, but the BCP rules. Listen to the Podcast Homily. Thanks so much for supporting the AIC online ministry. Pls consider sending links to our various Web pages (web site; You Tube channel; this Blog site; and the AIC Bookstore at amazon.com/Author/Ronald-E-Shibley. 100% of all book royalities are donated to the AIC.